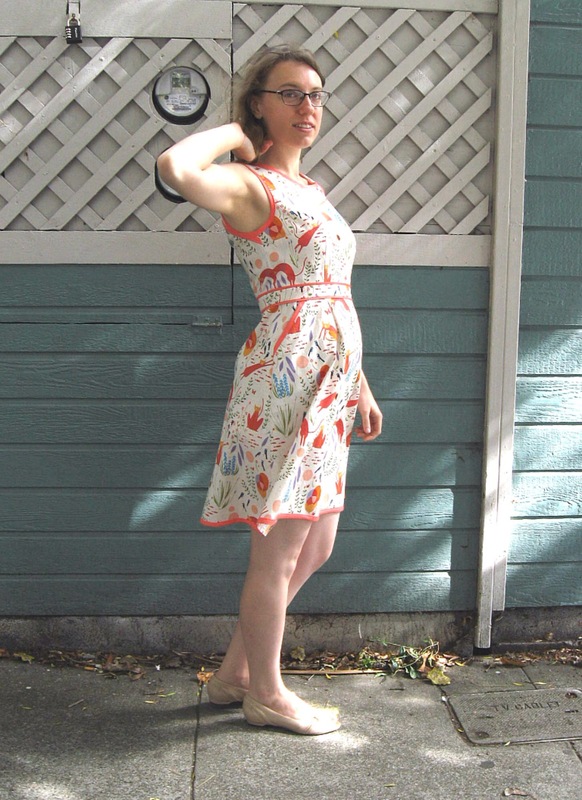 The top is made from a gorgeous Tencel jersey that I picked up from Eddie’s Quilting Bee in Sunnyvale, CA. Ironically, although the main advertised attraction for that shop is the quilting fabrics and supplies, the whole upstairs is fashion fabrics, including and entire wall of amazing Telio knits! And since there were mostly quilters shopping there, I pretty much got that whole upper room to myself. This was my first time making the 3/4 length sleeves, which, as you can see, turned out more like 1/2 length on my long arms. I think next time I do that sleeve length I’ll add a few inches, as it currently hits at an awkward spot right where my elbow bends and gets scrunched up in the crease. Other than that, I’m quite pleased with this version! This Hollyburn is my third, and certainly not my last! The fabric is a tightly woven polyester, which I chose because it doesn’t wrinkle at all, making it the perfect travel garment fabric. 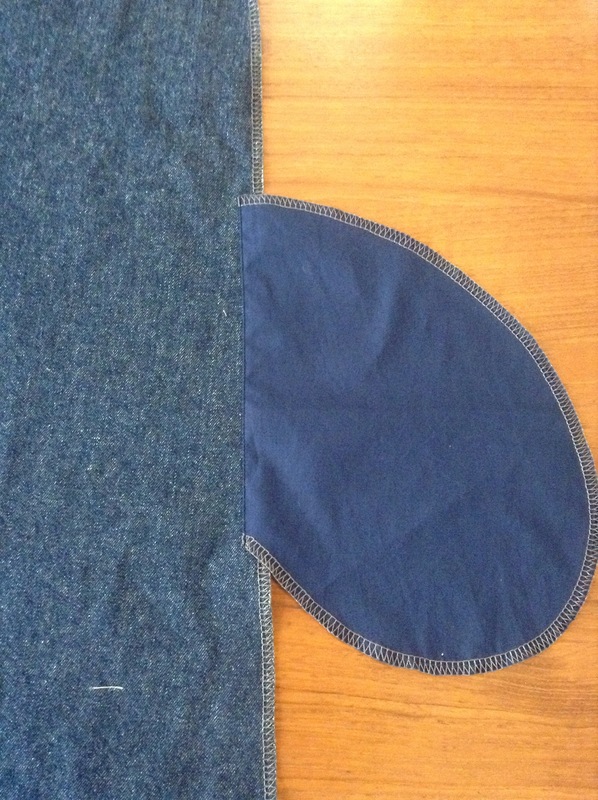 It was a bit strange to sew with, though – the weave was so tight that the fabric has literally NO give, so I ended up having to cut the waistband bigger and sew with 3/8″ seams instead of 5/8″. 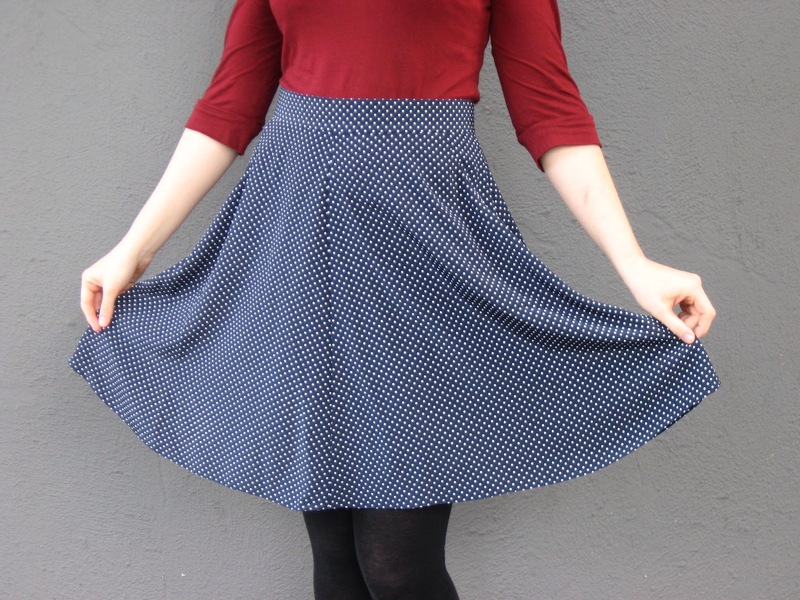 Also, the seams literally shrank as I sewed them – the center front and center back were a whole inch and quarter shorter than the rest of the skirt! So I let the skirt hang for a day before straightening the hem. Since I had to chop off so much fabric for the hem, I decided to do a tiny rolled hem to avoid shortening it too much. I like the way that type of adds a little more weight than normal, so I’m actually glad I was forced to choose that option, as I wouldn’t have done it otherwise. It takes longer to sew than a normal hem, but it was definitely the right choice for the fabric. Although my trip is over, I know I will wear both of these pieces for a long time to come! How about you – have you been working on basics this fall, or something more decadent? It seems like everyone is going on some exciting trip this fall, and are all making exciting sewing projects to assist in their travels! After reading all about Devon’s fabulous travel wardrobe and Lauren’s awesome travel gear, I got super excited and decided I needed a new mini wardrobe for my fall trip back to Boston and Philly to visit family. Of course, I decided this last week, and right now I’m in the airport waiting for my flight, so that didn’t leave me much time! 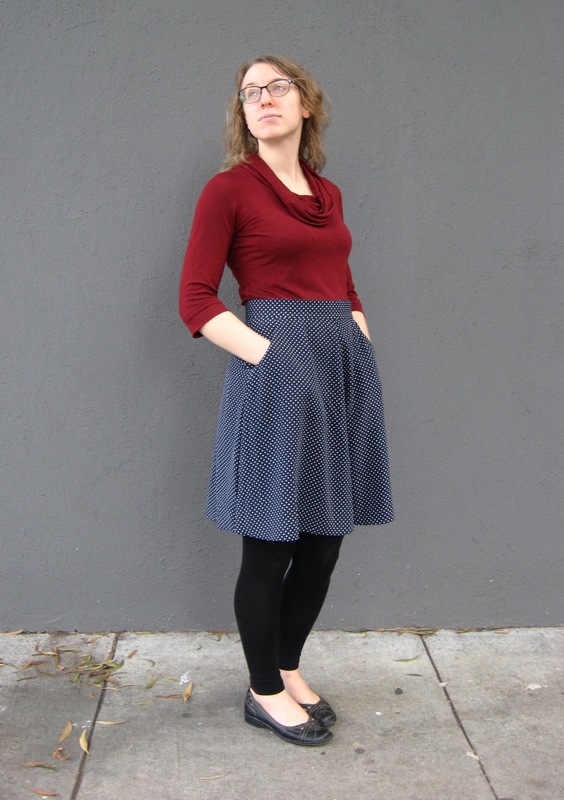 In spite of my self-imposed time crunch, I did manage to finish three coordinating pieces that are not only fun and practical for travel, but I think will be great fall basics as well. 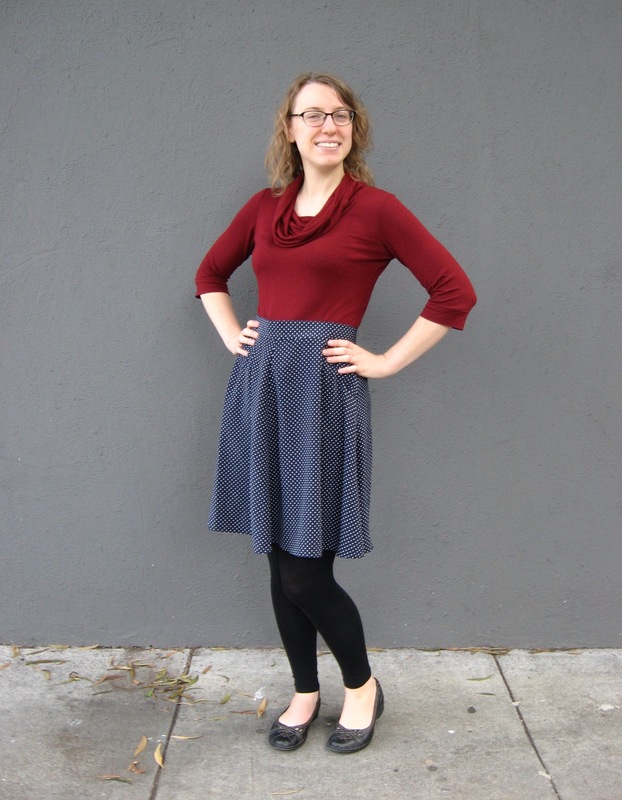 The three garments I made are: a denim Chardon Skirt, a navy and white polka dot Hollyburn Skirt, and a claret cowl neck Renfrew Top. I’ll be covering these items in separate posts, so today I’ll be starting with the Chardon. 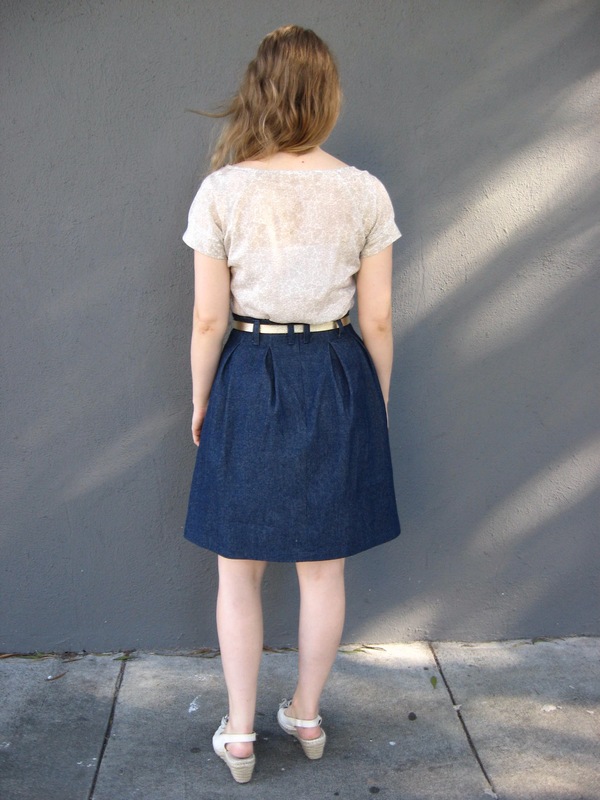 Once upon a time I had an awesome denim skirt in my wardrobe, but due to a rather unfortunate fly front zipper that unnecessarily accentuated my protruding tummy, it never looked right on me. 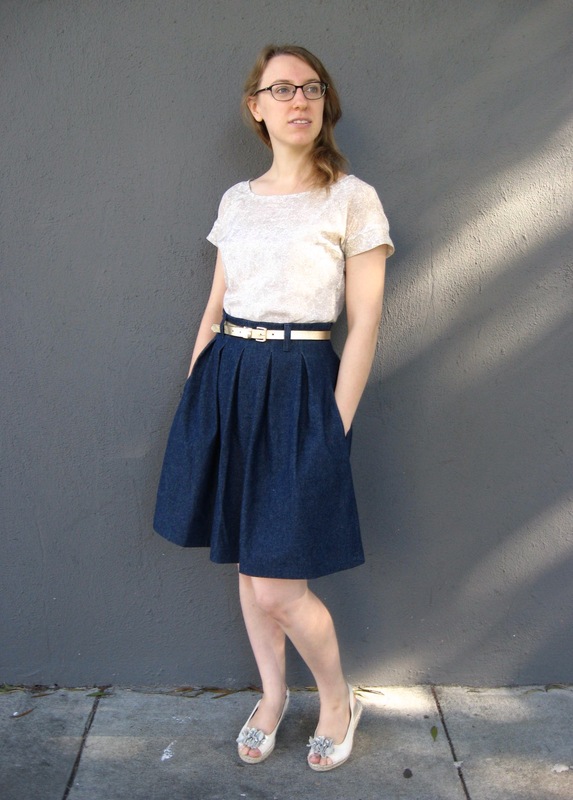 So, I sadly parted with it in my latest clothing purge, which left room for a new denim skirt in my wardrobe! 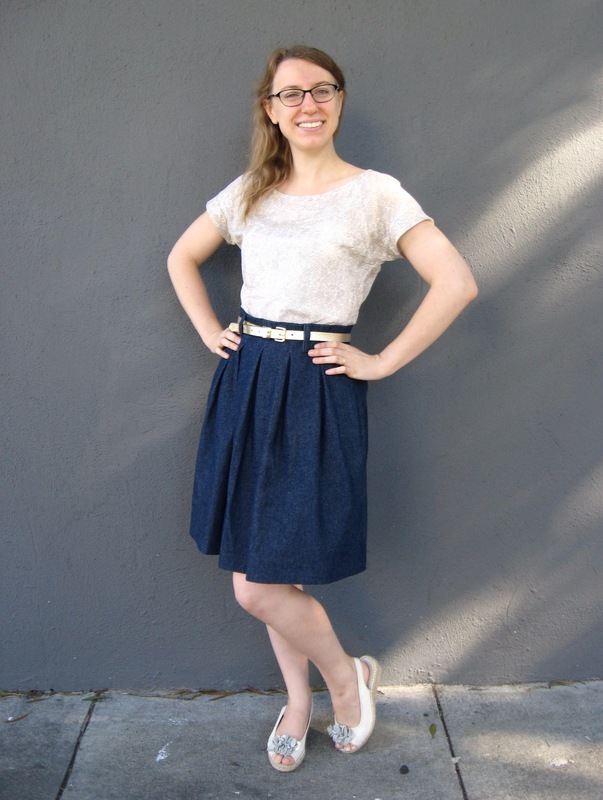 I had a bunch of Robert Kaufman denim in my stash from my summer binge shopping, and had been wanting to make another Chardon for a while, so it was a match made in heaven! The construction was pretty straightforward, though I did add a few steps to make things a bit cleaner/easier. 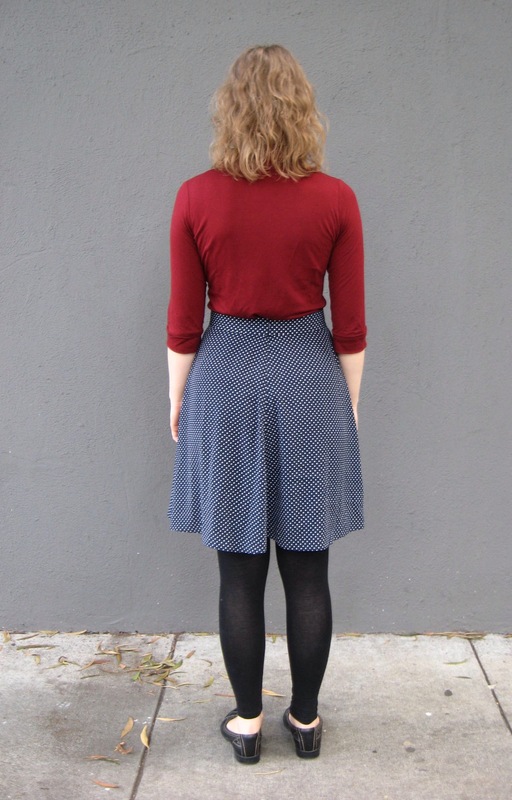 I understitched the pockets after attaching them to the skirt to keep them from rolling to the outside of the garment. I also used a lighter weight cotton fabric for my pockets, since the denim is quite thick and too many layers would be problematic. I also swapped out the belt loop pattern piece for the belt loop from the Thread Theory Jedediah Pants. 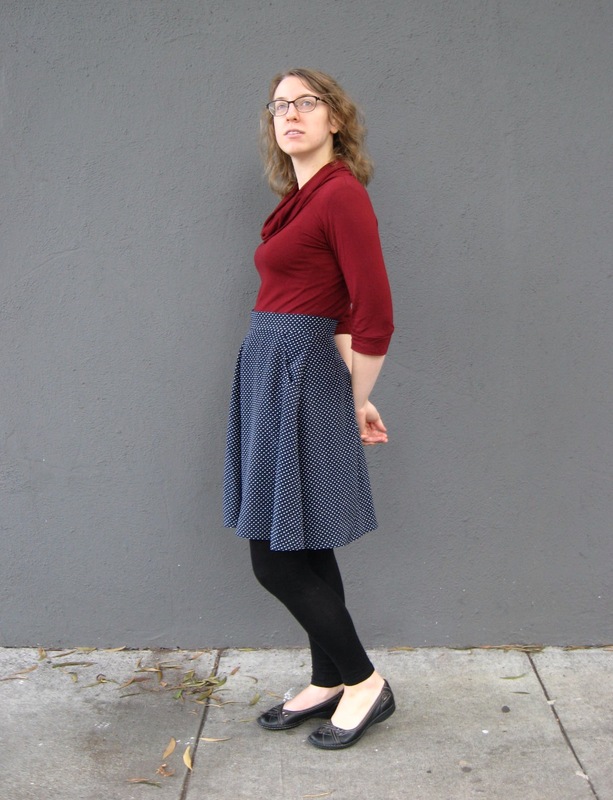 I hated turning the tiny loop pieces to the right side on my previous Chardons, and since I wanted this skirt to have a slightly more “rugged” look, I thought the swap was appropriate. I’m very glad I did – these are definitely my best belt loops yet! Oh, and that invisible zip? 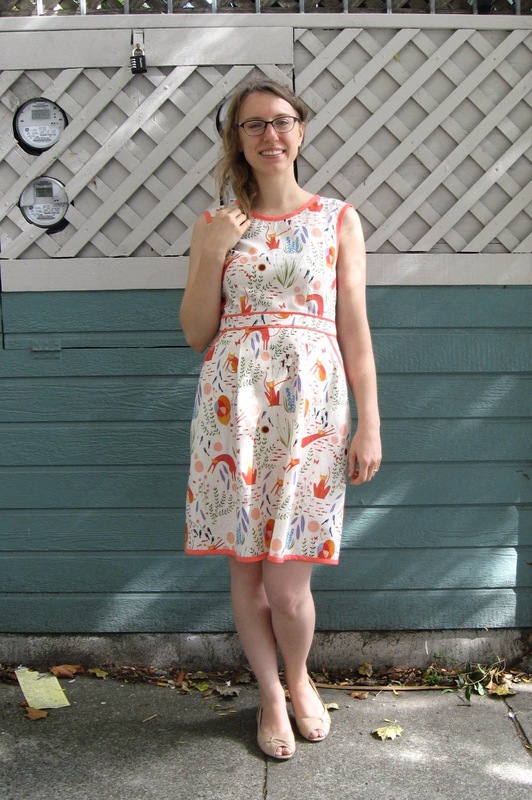 It was sewn just minutes after watching Lauren’s zipper class at The Sewing Party! Her class was one of the highlights of that event for me, especially since I’ve been feeling pretty meh about my invisible zips lately. Her method totally saved the day! 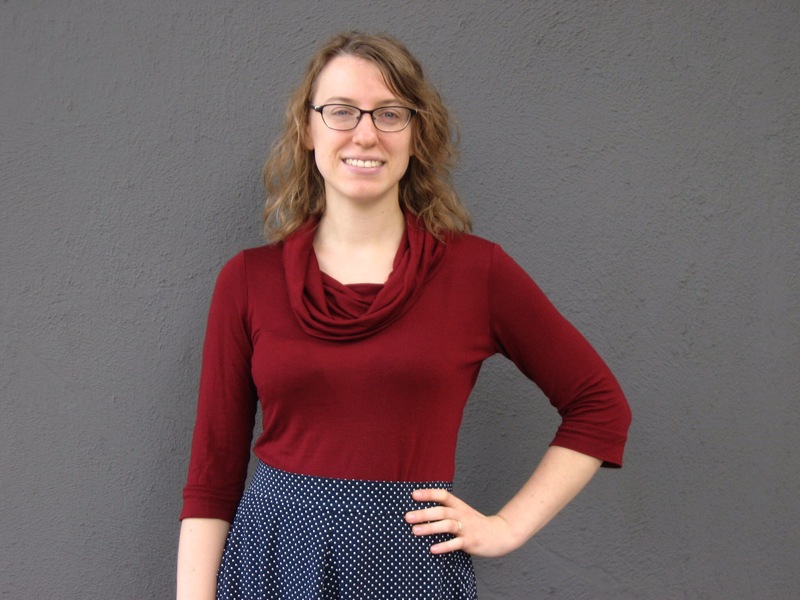 And in case you’re curious, the top I’m wearing is another Sewaholic Belcarra Blouse. I had made it over the summer with some lovely J. Crew silk/cotton voile I found at Steve’s Sewing back at home. I never got any pictures I liked of it back when I made it, and was having trouble finding a good bottom to pair it with until my new Chardon came along. I’ll take that as a good sign that it’s already filling some much-needed wardrobe holes! Now that we’re already several days into November, the temperature difference between San Francisco and the east coast is really starting to sink in – it’s still in the 60’s and 70’s here! Which utterly baffles me, especially now that daylight saving time is over and it gets dark so early. But hey, anything beats last year’s savage Boston winter! Although I miss seeing the leaves turn color and the air turn crisp, I can’t say I mind wearing my summer dresses. However, one thing I’ve discovered about the climate here is that as evening sets in and the sun goes down, temperatures do drop pretty dramatically. I mean, it is kind of a desert out here, after all! So although I can get away with short sleeves during the day, when I go out at night I need to dress for cooler weather. One thing I realized soon after moving here is that a big, warm scarf would do wonders to stave off the evening chill, and since I’ve really been in the knitting groove lately, I decided to get on that! I had actually bought some nice, chunky yarn last year on Black Friday from Fabric.com: two skeins of Lion Brand’s Wool Ease Chunky. 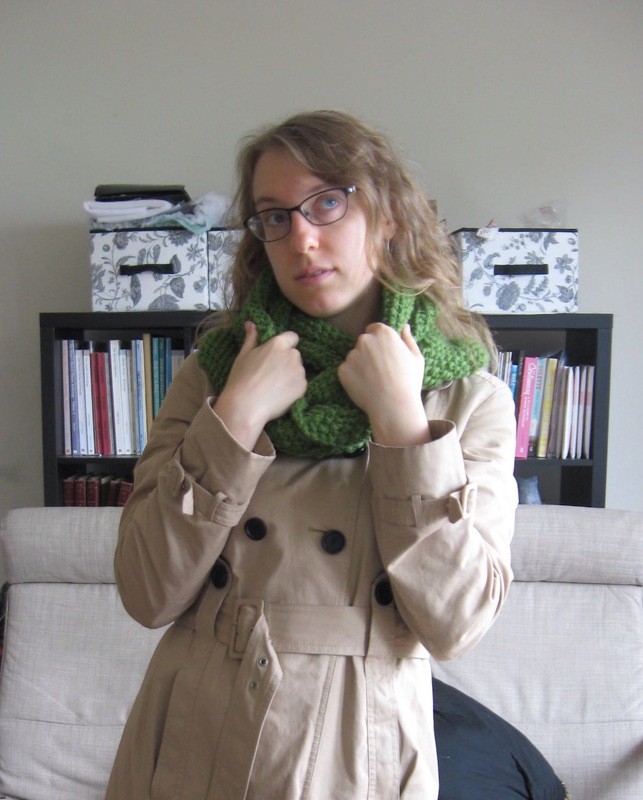 I was inspired by Tasia’s gorgeous cowl scarf, and decided I really needed one for myself! Granted, that was back when I though I would have to face another Boston winter, but I’ve already worn it here several times! 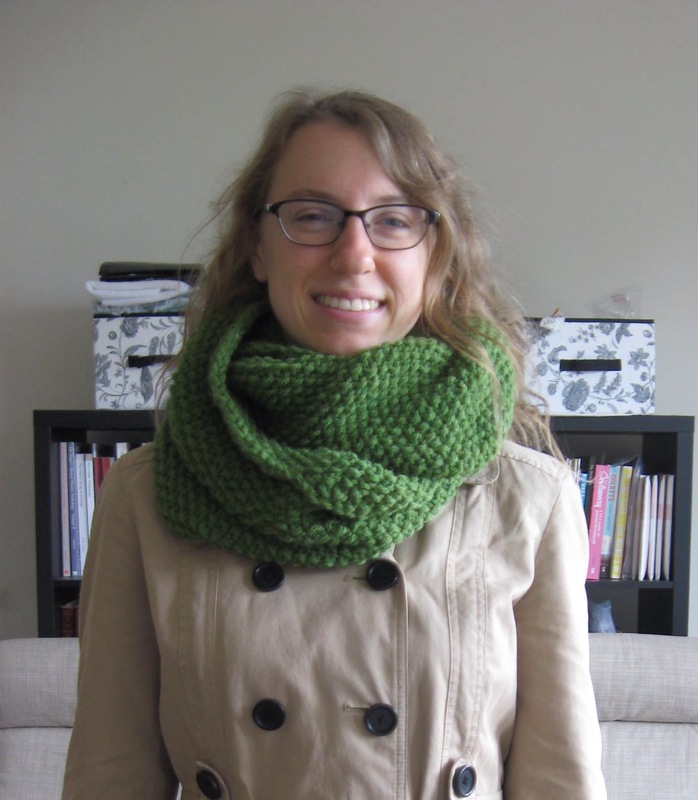 Like Tasia, I used the GAP-tastic Cowl Pattern, which is a free Ravelry download. 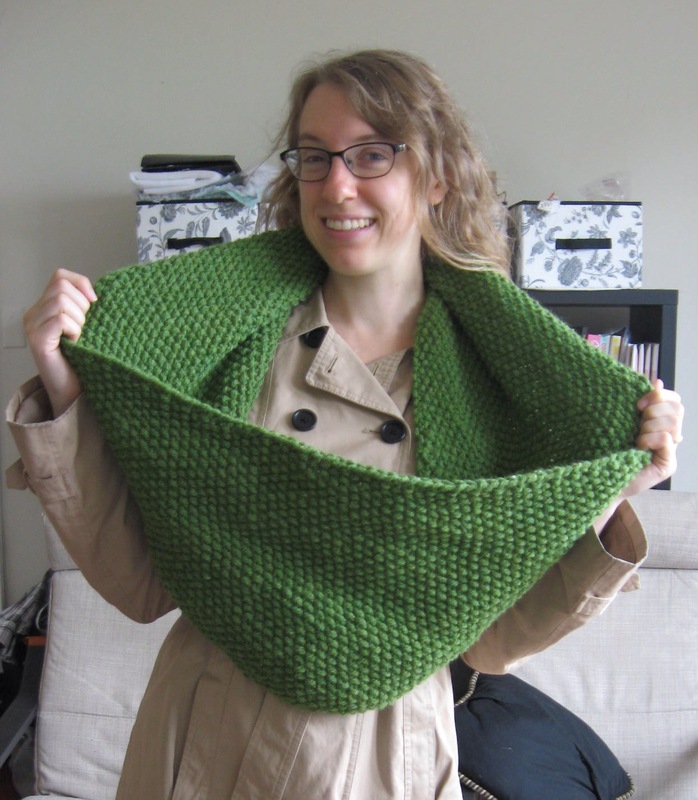 It’s great for beginning knitters, since it’s just the same stitch over and over…and over! I found it calming to keep knitting the same thing row after row, and it only took me a weekend to finish. Not bad! Mine ended up being a little narrower than the pattern recommended – 12″ instead of 15″ – but as you can see, it’s still plenty big! I can tell this will get lots of use throughout the fall and winter. Hooray for quick and easy projects that are also super useful! Happy Monday, y’all! I hope everyone had a safe, festive weekend filled with autumnal fun. My husband and I did manage to make it to a Halloween party on Friday night, but, alas, no pictures were taken. I ended up wearing my Daenerys dress – it was so nice to get to wear it again! My husband wore a partial set of his plate armor, aiming for a “Game of Thrones-ish” look. Cuz, y’know, every man owns his own set of plate armor. The best part of this is that those were costume pieces we just happened to have on hand last minute. We’re clearly too geeky for our own good :P. Oof. 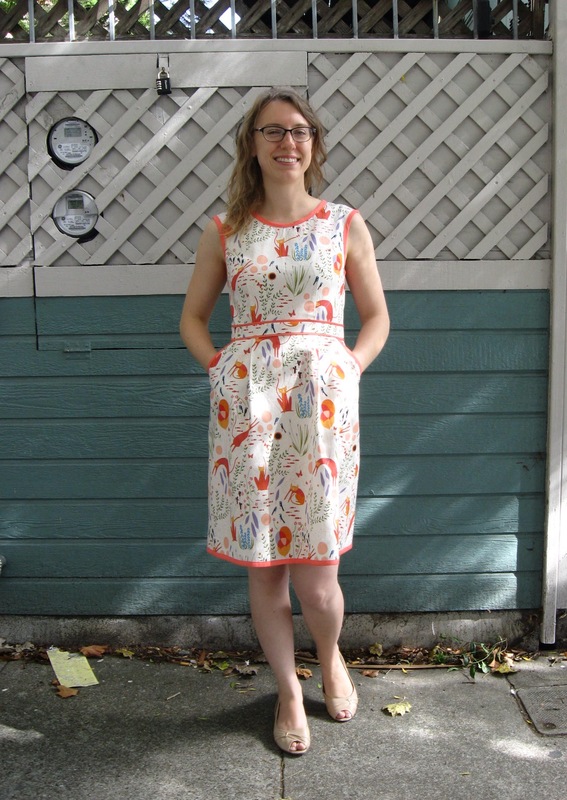 The pattern is another Deer and Doe pattern – this time, the Belladone dress. 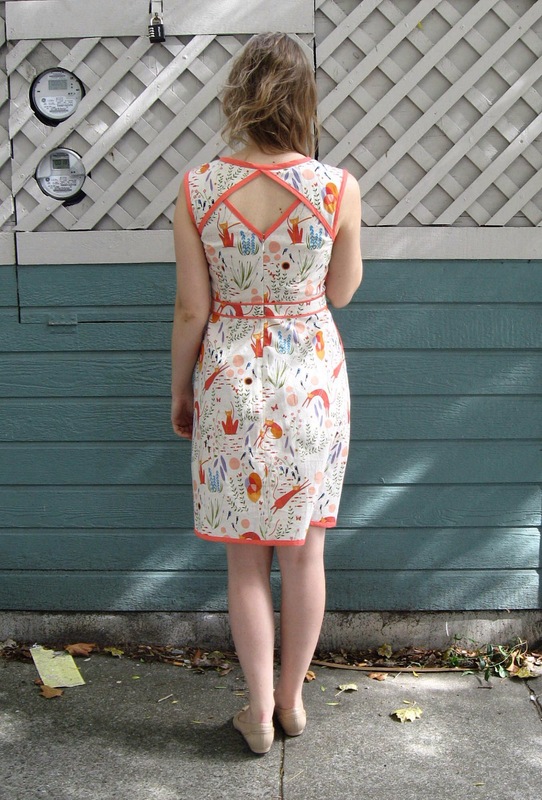 And if I was scared of the Reglisse, I was petrified of this pattern, with all the binding details and the back cutout. And yes, it was a little tricky to figure out how to get the binding the way I wanted it, but really, it was so much easier than I thought it would be! I’m now a total Deer and Doe convert – I’m absolutely in love with this dress!! Oops! 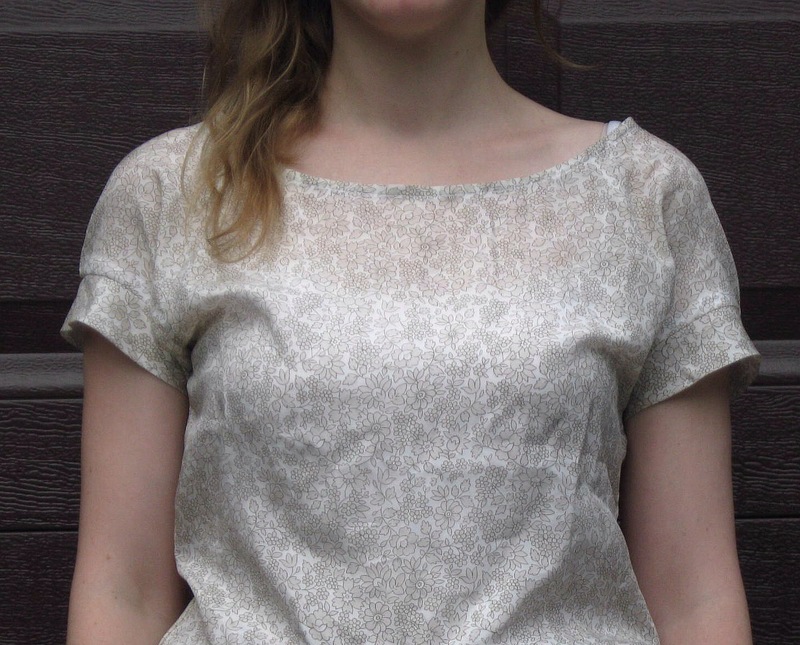 I’m guessing it was supposed to be 1/4″, which is what I used for the neckline. Also, for the back, I trimmed 1/4″ off of the cutout section, since the pattern has you turning under 1/4″ twice for a hem (so, 1/2″ total), and I just needed 1/4″ to add the bias tape. I should note that I used 1/2″ bias tape (that I made myself! ), and attached it like a reverse facing. 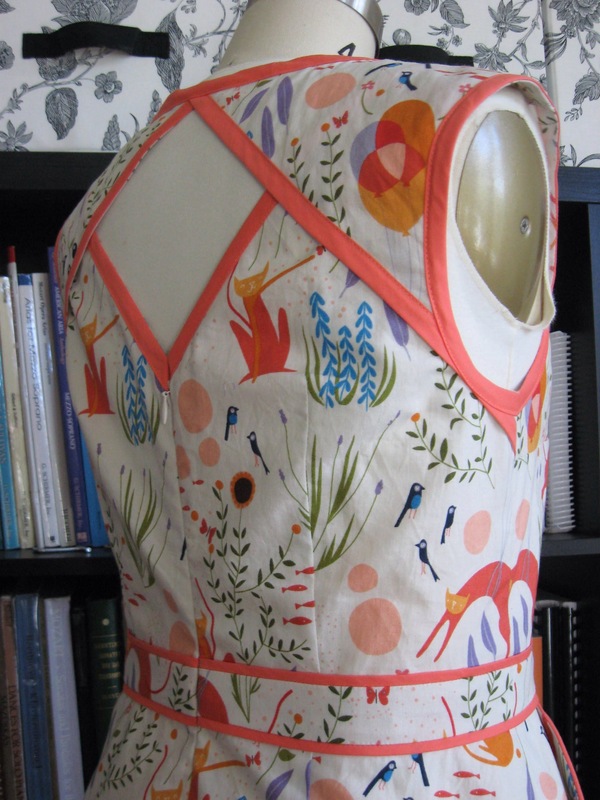 In other words, I sewed it to the wrong side of the garment, pressed it to the right side, and top-stitched. 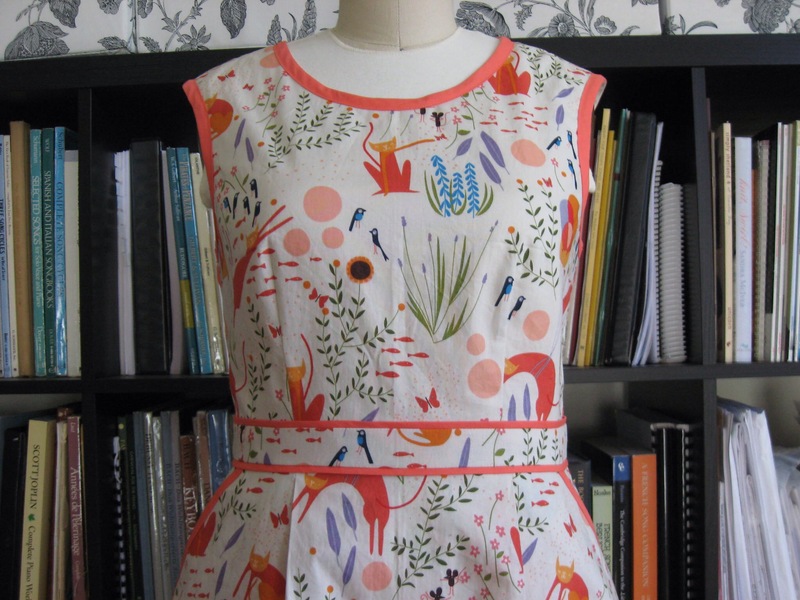 This created 1/2″ borders around the back, neck, armholes, pockets, and hem. 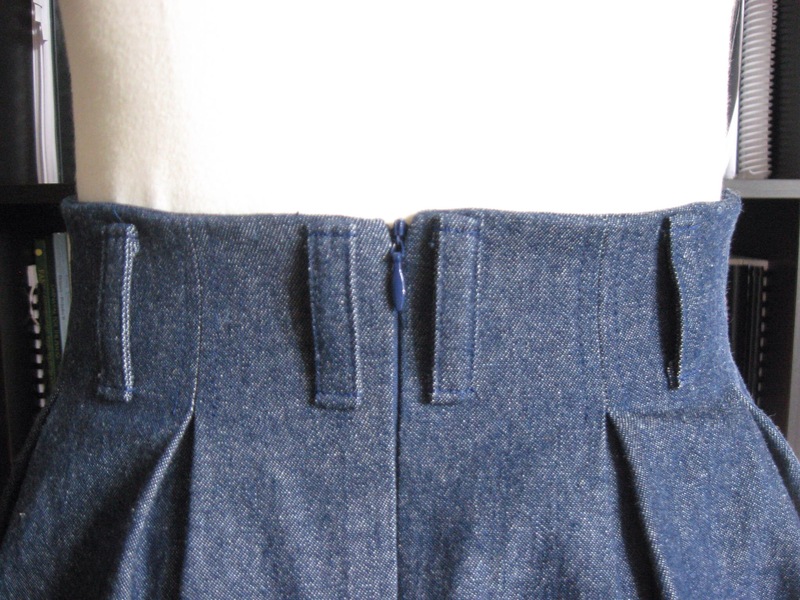 At the waistband, I added flat piping. I decided that it would look best to have that be 1/4″ instead of 1/2″ – larger just looked too big. So I cut 1 3/4″ bias strips, pressed them in half, and applied them using this method. 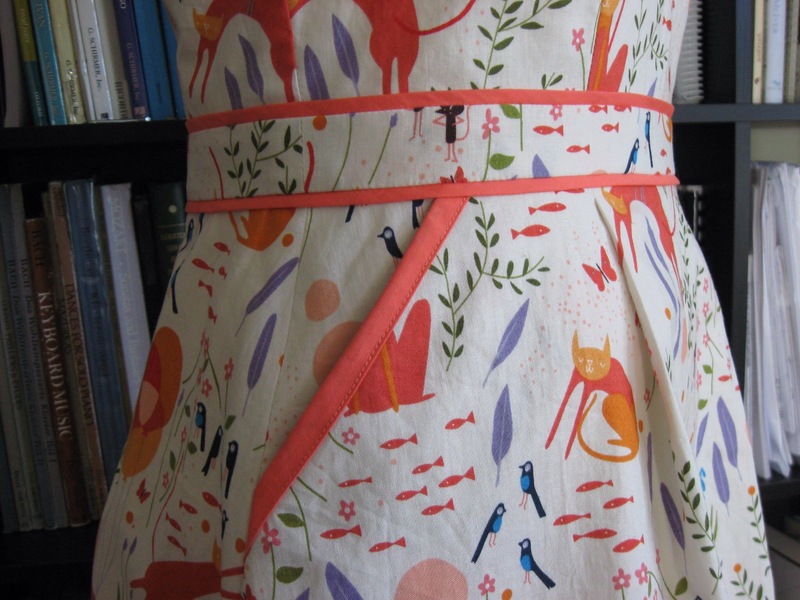 I can’t wait to wear this out and about and show off my crazy cat lady pride :).